Electric golf cart batteries are a quiet and "green" power source for your golf cart. They are the biggest investment in your golf car, but properly maintained you can expect many years of use. Electric batteries for golf carts come as sets in different voltage. The two most common are 36 volts or 48 volts. I have an electric Club Car DS that is 25 years old. It has had several sets of batteries replaced. The older model golf carts are typically 36 volt and have six 6 volt golf car batteries. The number of cells or holes will tell you what volt battery it is. Each cell is equal to 2 volts. so 3 cells X 2 volts=6 volts. The power and longevity of the 6 volt battery has served me well these 14 years. All the new electric Club Car golf carts use six 8 volt golf cart batteries. This provides a total of 48 volts. Here is a picture of my batteries in my newly refurbished 2006 Club Car. Other manufacturers use six 6v golf cart batteries or four 12 volt golf cart batteries. You can tell which golf cart batteries you have by looking at the number of cells. Four cells means the battery is an 8 volt battery. Plate thickness of the Positive plate is a major consideration when purchasing your golf car battery. This is due to what is called "positive grid corrosion". One of the major causes of battery failure is due to the positive (+) plate getting eaten away gradually over time, so that eventually nothing is left - the corroded material just falls to the bottom. What this means for you is that thicker plates means a longer battery life. Rolls-Surrette L-16 type (CH460) is .150"
US Battery and Trojan L-16 types are .090"
Crown L-16HC size has .22" thick plates. When it comes time to replace your electric golf cart batteries, many people wonder which is the best make to get. 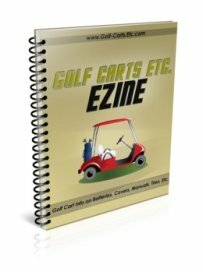 Golf courses, of course, like to use golf cart batteries that are going to be the most dependable and durable because of the constant use that they get. Trojan batteries are the deep cycle battery of choice for many golf courses. Right now all new Club cars come with six 8 volt Trojan golf cart batteries. 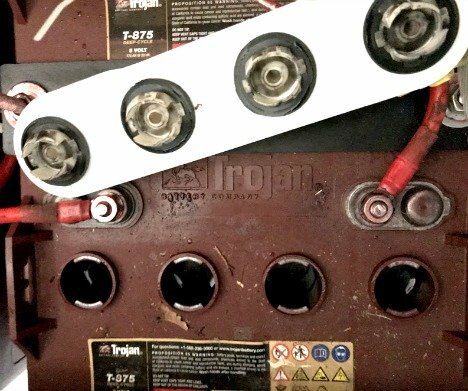 After being in production for over 50 years, Trojan knows golf cart batteries. They offer a durable and reliable battery. Better yet, Trojan offers technical support provided by full-time engineers. Trojan also makes golf car batteries as sealed absorbent glass mat (AGM) and GEL batteries along with the deep cycle wet batteries. The AGM and GEL batteries are maintenance free. Another well respected golf cart battery is made by Exide. 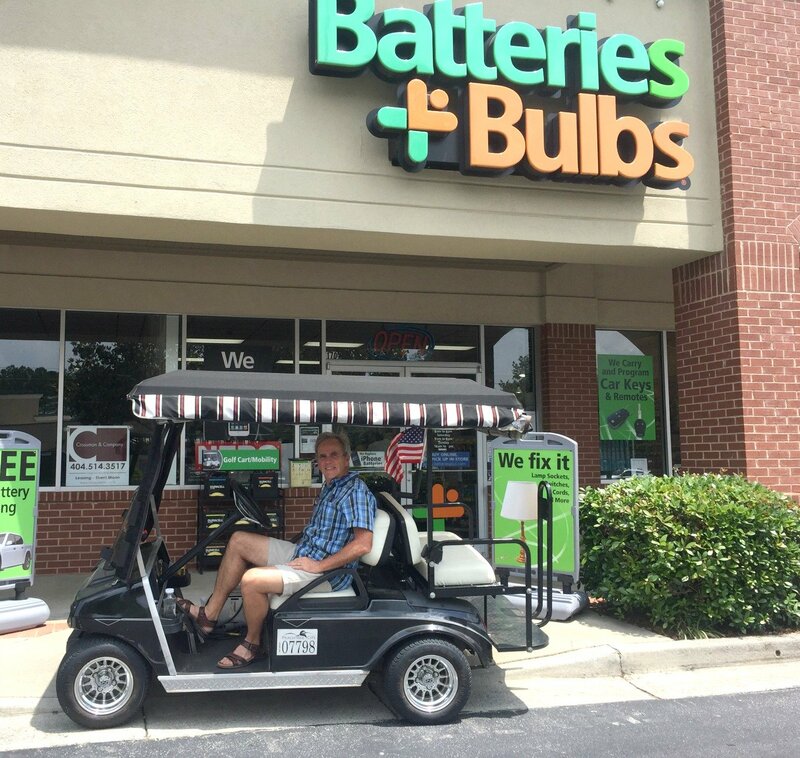 Exide golf cart batteries are the only batteries Dean from Affordable Golf Carts in Peachtree City puts into all of his refurbished golf carts. He likes their reliability and longevity - better than Trojan. 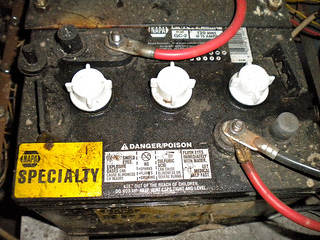 We have had Exide 6 volt golf cart batteries in our old 1987 cart and they lasted about 5 years. These batteries are now in our 2006 Club Car. When it comes time to replace your electric golf cart batteries, it can be costly - actually several hundred dollars. One reason is that you can't just replace one battery - you need to replace all of them. So you may be tempted, like me, to use discount golf cart batteries that will cost you less money upfront. I bought a new set of batteries for my electric Club Car golf cart from Napa that was about $100 less than the Trojan or Exide batteries. I've had them over 3 years and so far, no problems. You can also find brands like Duracell lead acid batteries at your local Sam's Club. One of the biggest costs of owning an electric golf cart is replacing the deep cycle or lead acid set of batteries. The typical life span is about 5-7 years depending on how the cart is used, what kind of regular maintenance is performed and the type of climate. How doe you know when it's time to replace the batteries? When they won't hold a charge for long and the cart won't go as far as it used to on a full charge. What do you do when it's time to get a new set of batteries? Check around locally for the cost of a set of batteries and for the install price. 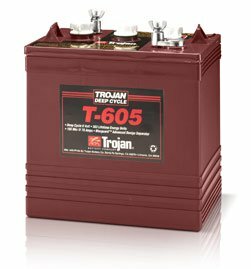 Besides your local golf cart dealers, Batteries+Bulbs offers Trojan batteries at our local shop. You may think that working on a golf cart is no big deal, and certainly it is not as complicated as working on a car. 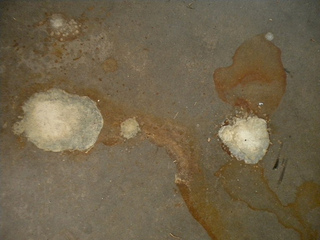 However a golf cart uses electrical systems and you are working around sulfuric acid and hydrogen gases - all of which can cause some serious damage - like this picture of our garage floor. Follow your golf cart manufacturers recommendations before starting any work on your golf cart. 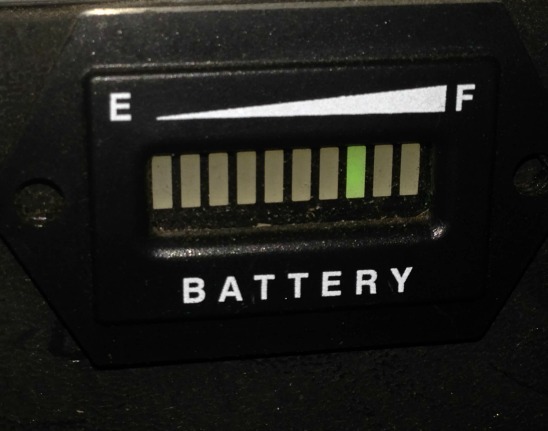 A golf cart battery charge indicator needs to be on every golf cart. Who would drive a car without a fuel gauge? Same with a golf cart - you need to know how much the batteries have discharged. Far right means fully charged and far left means there's not much charge left to get you home. Charge meters are specific to 36 volt or 48 volt golf carts. 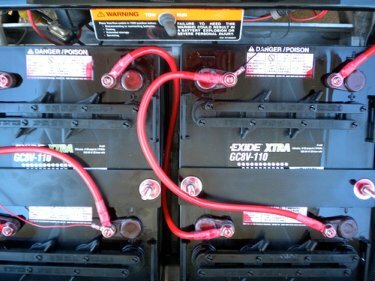 There are some very important tips on properly charging your electric golf cart batteries that will help lengthen the life of your electric golf cart batteries. 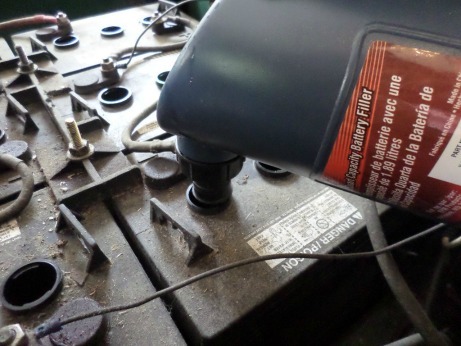 Likewise, do some of the stupid things I've done to my cart batteries, and you may find yourself replacing your batteries a lot sooner than you need to. 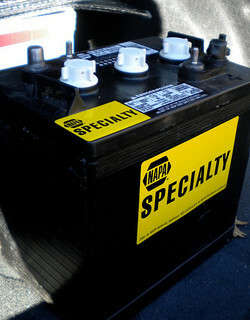 Proper golf cart battery maintenance can add years to your electric golf cart batteries. Replacing a set of batteries can cost more than $500 - so you want to keep the ones you have as long as possible.